Eureka Springs, Arkansas is home to over 25 miles of deep woods trails or paved paths, easily accessible from the heart of the beautiful Victorian Town! The Ozark Mountains paint a majestic backdrop for this small town and make it’s network of trails world famous. Don’t take our word for it, check out these great places to explore Eureka Springs Trails. 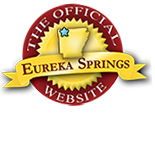 The Eureka Springs Parks Commission is charged with the upkeep of over 63 Springs, many kept in a similar state to when thousands of health seekers were drawn to Eureka Springs for healing. All around Eureka Springs, you will notice springs bubbling up from the ground. There are even a few spring-fed waterfalls in Eureka Springs. Harmon Park is a must with kids. Centrally located near the Crescent Hotel, Harmon Park offers a community Skatepark, playground equipment, stage, picnic areas and trailhead for bikers headed on the in-city trails or out to Lake Leatherwood Park. Harmon Park is also PET FRIENDLY as our community bark park lets our four legged friends run out some energy. There are over 21 miles of multi-use trails at Lake Leatherwood City Park are designed as low-impact, single track nature trails for foot and bike traffic. Many rocky ledges, steep slopes, extended grades, creek crossings and varied terrain make most trails challenging for both foot and bike traffic. Enjoy the trails encircling the lake to access a non-motorized boat launch, a picnic area, several fishing spots, two wooden bridges and about one and a half miles of hiking and bike riding. Standing Rock, a vertical sandstone remnant, protrudes from the depths of the lake along Standing Rock Trail – while Sycamore Spring flows into the lake crossing Sycamore Spring. The Bluff Trail hugs the St. Joe geological formation, and amazing limestone outcropping, and features overviews of the lake and runs just above Sycamore Spring Trail. This entry was posted on August 3, 2017 by service424 in The Great Outdoors, Things to Do and tagged Black Bass Lake, eureka springs nature, harmon park, hiking, Lake Leatherwood, nature trails, springs.